For same strange, or maybe not so strange as I'm sure its due to affinity, reason a lot of my friends are Scorpios (November birthdays). So the second half of October and first part of November is usually a busy time for me with celebratory birthday lunches, dinners or outings. For these instances I love dressing up to give importance to the occasion. I mean half the fun is planning the outfit, isn't it? I based the outfit on this beautiful Timothy McDowell painting. I like the kind of translucent colors it has with the darker pops of red and burgundy. It has a dreamy quality. And this dress?? Please! Cute and festive, what more could you ask for in a party dress? Well, there is one more thing it offers- the price is amazing as well. How perfect would also be for the holidays? 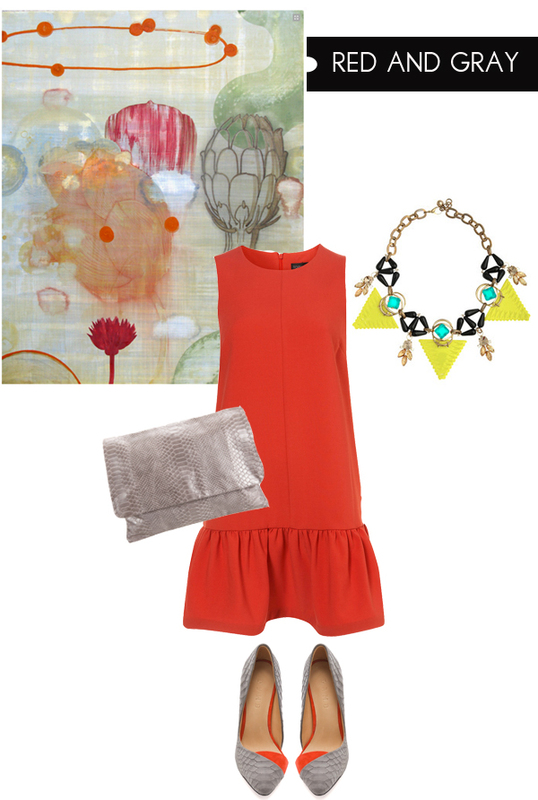 I won't gush over the shoes, necklace and clutch, because I know you know I just love these. I'm so happy I get to celebrate with my friends in the upcoming weeks. Do you have any fun birthday plans coming up? Love that dress, and those shoes are fab!! Love the painting and that necklace is heaven! You are such a fashionista lady! You should know that I tried to order that black dress you featured recently and was so bummed to learn it was sold out. arrgh. anywho, love the dress but it will never fit this big booty over here. I'll therefore take the shoes and bag. very fab. your friends have good company: my son's birthday is in November, as is Debbie's. I just love those heels, they are fabulous! love how you got inspiration from that painting! that dress is def on my list an i love those shoes!! This post is so appropriate. I just celebrated 29 yesterday! Since it was a Tuesday we will be continuing the festivities all weekend. Whoa! LOVE the outfit AND the painting! O agree! I love the dress and the shoes!! But most of all that necklace!! What are we doing for our bdays??? I love the dress and the shoes!! But most of all that necklace!! I fell in love with these grey and coral shoes! That dress is just gorgeous! Love the color! I'm diggin that painting...I like how you curated this together!